Christmas Valley is known for its beautiful setting, tucked within the mountains along Hwy 89 as you leave Meyers and head toward Hope Valley. Home owners enjoy dramatic views of the mountains, pine forest and aspen groves. 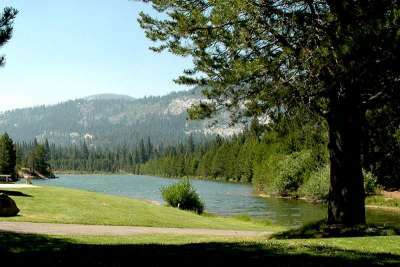 They also enjoy the benefits of living so close to the Truckee River that runs through the valley. Fishing, beautiful walks along the river and swimming in any of the special swimming holes are just a few of the perks you can enjoy should you choose Christmas Valley. There are several hiking and biking trails within the valley that make it easy to get outdoors for some real “close to home” recreation. Christmas Valley is also home to the well known Old Meyers Grade simply called the Grade by the locals who walk it for their daily cardio work out. Avid skiers who want to spend less time driving and more time on the slopes will appreciate the quicker access to the Kirkwood and Sierra-at-Tahoe ski resorts since Christmas Valley is one of the closest neighborhoods to these resorts. Christmas Valley homes are generally built on larger, flat lots compared to most homes in the South Lake Tahoe area. There is a mixture of rustic cabins, ranch style, chalets, and newer construction homes that offer a nice variety of size and style. Christmas Valley is technically broken into three areas called Christmas Valley I and II and the third being US Forest Service cabins. There are many local residents who make this area their home, but you will also find significant second home ownership in the area as well. Christmas Valley offers a peaceful setting away from the city of South Lake Tahoe, yet driving into town is just a quick 10 minutes. Christmas Valley residents enjoy the conveniences of the local Liras’ market, gas stations, post office, several restaurants, Tahoe Paradise golf course and Meeks building supplies. Christmas Valley is worth considering if you want to be away from the city area and enjoy the dramatic, beautiful setting that it has to offer.